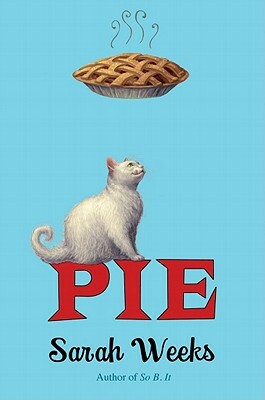 PIE by Sarah Weeks (Scholastic, October 2011, for ages 9 to 12). Synopsis (from publisher and Indiebound): Who would leave a world-famous pie recipe to a cat? When Alice's aunt Polly, The Pie Queen of Ipswitch, passes away, she takes with her the secret to her world-famous piecrust recipe. Or does she? In her will, Polly leaves the recipe to her extraordinarily fat, remarkably disagreeable cat, Lardo... and then leaves Lardo in the care of Alice. Suddenly, Alice is thrust into the center of a piestorm, with everyone in town trying to be the next pie-contest winner ... including Alice's mother and some of Alice's friends. The whole community is going pie-crazy . . . and it's up to Alice and her friend Charlie to discover the ingredients that really matter. Like family. And friendship. And the pleasure of doing something for the right reason. Why I liked it: It's great fun! If you think of this book as a pie, the filling is historical fiction (this takes place in July 1955) with a dash of small-town flavor (the made-up town of Ipswitch, Pennsylvania), wrapped in a crust made from a full measure of mystery with a dusting of whimsy. Spicing it all up are fourteen actual pie recipes that Sarah Weeks baked while writing this book. If reading this doesn't make your mouth water, I'd be amazed. Alice is a spunky MG heroine, grieving for her beloved aunt and determined to find out who's trying to steal Aunt Polly's recipe (and Aunt Polly's cat!). I enjoyed the references to Sky King, Bob Hope and other icons of the 50s. Also loved the growing friendship between Alice and Charlie, though I was a tad surprised by the epilogue that takes place 40 years later. If the book had ended after Chapter 13, I'd still have been as satisfied as if I'd feasted on key lime pie (my favorite!). What's YOUR favorite pie? And what marvels of middle grade lit have you read this week? Over the next month, I'll be featuring some Pennsylvania authors in my YA Fridays! I plan to culminate the series with another giveaway, possibly of a signed book or books, so stay tuned in October.. 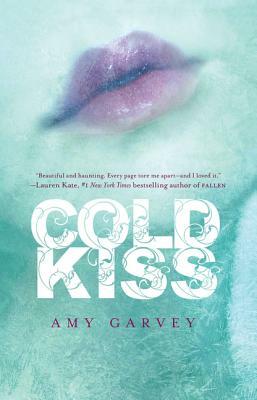 COLD KISS by Amy Garvey (Sept 20, 2011, Harperteen, for ages 12 and up). Visit her blog! Synopsis (from the publisher): It was a beautiful, warm summer day, the day Danny died. Why I Liked It: The voice is fantastic! When I met Amy recently (she lives in my hometown!) she told me that although she's been writing adult romance and mysteries for years, her voice is really a YA voice. And I believe it. This is powerful writing by an author at the top of her form. Amy Garvey's writing is so precise and expressive that I could see every scene clearly in my mind. The details jumped out at me, making Wren's story feel hauntingly real. I found myself completely accepting her ability to bring Danny back to life. And the fact that he was... different was chilling. This is a horror story as much as a love story. I read this in one sitting, on a cool, rainy day, so it was the perfect shivery atmosphere. I loved that all the women in Wren's family have the power to tap into the earth's energy, and that they all manifest it differently. And I loved Wren as a character, and ached for her having to make that difficult decision. Gabriel was also an intriguing character and provided much-needed hope for Wren. And, hey, you've gotta admit, the cover's fantastic! What fantastic YA novels have you read this month? MMGM: Secrets at Sea by Richard Peck ... And a WINNER! Congrats, Jill! Expect an email from me asking for your address, so I can mail your prize to you! And thanks to all for entering. Now on to today's MMGM! 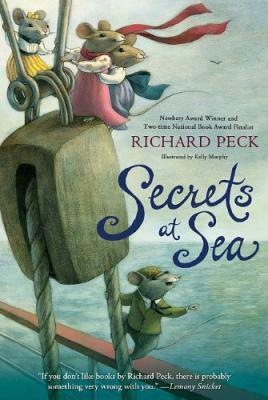 Secrets at Sea by Richard Peck, illustrated by Kelly Murphy (coming Oct 13, 2011 from Dial Books for Young Readers, for ages 8 to 12). Synopsis (from the publisher): In the beloved tradition of The Borrowers, The Tale of Despereaux, and The Cricket in Times Square, here is an irresistible adventure story of the tiny individuals who secretly live among us humans. Helena is big-sister mouse to three younger siblings, living a snug and well-fed life within the ancient walls of the Cranston family home. When the Cranston humans decide to sail away to England in search of a husband for their awkward older daughter, the Cranston mice stow away in the luggage . . . and so begins the time of their lives, as they meet intriguing, cosmopolitan mice onboard and take it upon themselves to help the human Cranston daughters find love. They might just find perfect futures for themselves as well! Why I liked it: Helena's story is utterly charming. This reminds me, right down to the pencil drawings by Kelly Murphy, of one of my favorite animal tales, Miss Bianca by Margery Sharp. But the plot is unique and quintessentially Peck. He's included sly little asides that might go over the head of a young reader, but would be thoroughly enjoyed by a parent or grandparent reading aloud to a child. Wish I could quote from the ARC, dang it all! But there's a moment where he makes a cheeky reference to a very well known children's book about a mouse. I laughed out loud. I adored the idea of the mice having to fix everything for those poor clueless humans. Plus there are cute mice in Victorian clothing, the ingenious use of thimbles, lots of cheese, and a one-eyed cat. Irresistible! Richard Peck is probably our greatest living children's writer. He's written a slew of books, won a Newbery medal and a Newbery honor, the Edgar Award, the Scott O'Dell award, the Christopher Medal, and the Margaret A. Edwards Award for lifetime achievement. he's coming to the bookstore where I work!! Can you hear me squealing? If you live anywhere near the Philadelphia area, please come to Chester County Book & Music Company on Monday Oct 24 at 6:30 pm to meet the inimitable Richard Peck. It's possible that after his visit I'll be giving away a signed hardcover copy. Stay tuned. Are you a fan of Tale of Despereaux or The Borrowers? Then you'll love this book. If not, what's YOUR favorite animal fantasy? Marvelous Middle Grade Monday - 13 Gifts and a GIVEAWAY! I debated taking today off since it's a holiday here in the States (Happy Labor Day, everyone!) but I love this book so much I couldn't wait to tell you about it (and give away my hardcover copy!). This is the book I read when our power first went out during the hurricane, and it kept me turning pages even with the hassle of a booklight. 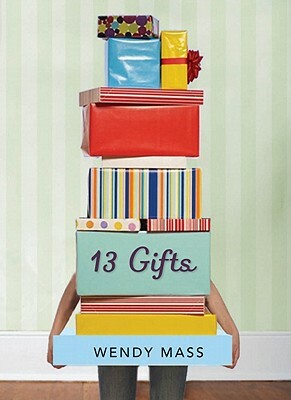 13 Gifts by Wendy Mass (Scholastic, September 1, 2011, for ages 8 to 12). Synopsis (from the publisher): When Tara, a self-proclaimed shrinking violet, steals the school mascot in order to make some friends with the popular crowd and gets caught, she finds herself in a heap of trouble. In addition, her parents decide that instead of taking her on their summer trip to Madagascar to study the courtship rituals of the Bamboo Lemur, she must go stay with her aunt, uncle, and bratty cousin Emily St. Claire in Willow Falls. Tara thinks it's a good time to start over; she'll be turning 13 after all, so she might as well make the best of it and perhaps even attempt to break out of her shell (in a non-criminal manner). What Tara doesn't know is that this charmed town has something big in store for her on her 13th birthday. It's not a typical birthday. But then again, nothing is Willow Falls is exactly typical! Why I liked it: The amazingly talented Wendy Mass scores again with another hit for tweens. Like its companion novels, 11 Birthdays and Finally, 13 Gifts is an adorable and funny book set in a small town where anything can happen. In this case, it's a rollicking scavenger hunt for the thirteen obscure objects that the mysterious owner of the antique shop asks Tara to find. A touch of magical realism adds to the charm of this already-charming story. Tara grows as a character and seems like a real girl. And I enjoyed coming across old friends from the other books. I'm always impressed with books like this, where a series of hilarious events that seem to have no connection at all click into place by the end. And I didn't see it coming. Girls who enjoy a bit of magical realism with their contemporary stories will devour this. That's it! This giveaway is open internationally and ends at 11:59 EDT on Saturday, Sept 10, 2011. I'll let randomizer pick a winner and I'll try to announce it no later than Monday Sept 12.